More than 100 years ago, the Holdrege Commercial Club, the predecessor to the present Holdrege Area Chamber of Commerce, came into existence. 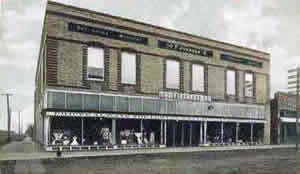 Since that time, the Chamber has participated in legislative battles, water battles, and road battles; informed the public during political elections; sponsored scores of community celebrations such as the Harvest Festival in 1907, Diamond Jubilee in 1958, Phelps County Centennial in 1973, and Swedish Days. Almost every imaginable type of entertainment has been promoted by the Chamber, including rodeos, car races, auto shows, air shows, fashion shows, carnivals, jubilees, grand opera, barbeques, and holiday celebrations. It has played host to some of the most famous people in the world such as John Philip Sousa, John McCormick , Will Rogers, Phil Harris, Dorothy Lamour, and a whole raft of "brand-name" country music entertainers in late 1980s and 90s. The Chamber has always relied on the age-old principle of mutual self-help through voluntary manpower. It has sought, through its board of directors and committee structure, to harness and involve the talent, imagination and creative abilities of local business leaders in planning and carrying out programs designed to solve problems and to seek opportunities for the betterment of the Holdrege area. In 1908, eight committees were appointed: Parks, Railroad, Publicity, Information, Public Improvements, New Industries, Membership, and Headquarters. That year they had 56 members. One of the first issues the Chamber tackled was that of grain markets. 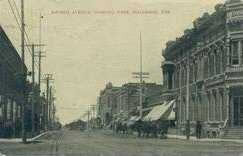 In 1909, Holdrege markets paid one to four cents less than was being paid in the towns of Funk, Ragan, Wilcox and Orleans. It was agreed that to secure a satisfactory wheat market, the farmers needed to form a Cooperative Elevator Company. The Commercial Club voted to help in re-organizing and placing the stock in the hands of as many farmers as possible. That same year several members attended a convention in Norfolk. It was recommended that a "Bureau of Information" office be established for those seeking homes and looking to invest in the community. They also looked into what would be needed to hold a county fair and to put an electric sign at the railroad depot. In 1920, with 126 members, Adolph H. Held became the first paid secretary at $50 per month. The Chamber Board repealed the old constitution and adopted a new constitution and by-laws that stated that "only those members contributing to the budget had the right to vote on issues." The Chamber investigated bringing the Hastings Business College to Holdrege, holding a Pumpkin Show, hosted a meeting with the medical professions on the "deadly work of cancer", opposed the Daylight Savings Law, and assisted with the State Sunday School Convention that was held in Holdrege that year. The effect of the Depression on the economy during the 1930s also affected the Chamber. Many merchants were victims of "rubber checks" and there were many "sheriff’s sales" due to foreclosure. By this time, the Chamber had four main goals: support of the South Platte United Chambers of Commerce; endorsing the Tri-County Irrigation project; bringing a July 4th fireworks display back to the community; and raising funds for Christmas decorations on the street corners. They celebrated Montgomery Ward coming to Holdrege and the fact that the Knudsen-Morrison & J. A. Terteling companies, which would construct 96.6 miles of canals for Tri-County, had settled into offices in the Schrock Building. There were many concerts, symphony orchestras, pianists, and other live entertainment performing at the City Auditorium. One retail promotion was "Rooster Days". Farmers brought roosters to the Creamery & Produce Company who bought them for 10 cents a pound, issued in script which could be used at Chamber member businesses. Businesses then redeemed the script at the Chamber Office. Later, the Retail Committee sponsored Turkey Day, where more than 50 birds were given away and over 75 businesses participated. As War news became predominant in the mid-40' s, the Chamber encouraged people to support the "old aluminum drive" for the manufacture of airplanes, and held a "Scrap Iron Campaign". Holdrege citizens purchased 30,000 cigarettes to send to soldiers overseas. The Chamber purchased welcome banners and U. S. flags and asked the City to purchase brackets to hold them. Meetings were held quarterly in the evenings. The Independence Day celebration on July 4th was expanded to become a day-long event, including a carnival. The Chamber warned of counterfeit and stolen government checks and businesses were cautioned to make sure they got some type of identification before cashing them. Near the end of the 1940s, the Chamber had ten committees and over 100 volunteers, but was in debt. They worked hard to sponsor fundraising projects to help get the organization out of debt and moved into an office in the City Building to help cut expenses. They celebrated that there had been several new business openings in town and they were hopeful for the future. They sold certificates of stock to form "Rental Homes, Inc.", which later became the Holdrege Industrial and Development Corporation. Industrial recruitment was the priority for the Chamber, who worked through the Holdrege Industrial and Development Corporation. The organization received its non-profit status from the Internal Revenue Service and hired a secretary for the Chamber manager. There were five main committees: County Fair Committee; Contractor's Committee; Zoning and Legislative Committee; Public Affairs Committee; and the 75th Anniversary of Holdrege Committee. The biggest hurdle for the Holdrege 75th Anniversary celebration in 1958 was a shortage of funds. The City had agreed to contribute $I,500 but the committee would have to raise the balance. The Chamber office set up a community calendar and urged persons in charge of meetings and events to let the Chamber know about them so they could be added to the calendar. At a Chamber dinner, members were told that 80% of the new businesses were created by businesses already in Holdrege, and that they needed to look at ways to keep the youth from leaving the farms for other areas. Chamber businesses closed their stores to host 9,000 visitors at a free Buffalo Barbeque; a new Safeway store was announced; and City of Holdrege began contributing financially to the Chamber. The Chamber board adopted a policy whereby the Chamber would only make purchases from members whose dues were not delinquent; a memo from the Chamber president stated the board was faced with the "budget blues" and a special session would be required to balance the budget. It was also felt that someone needed to be solicited to regularly attend the South Platte United Chambers of Commerce meetings. The Chamber celebrated the creation of new jobs due to the recruitment of two new manufacturers to Holdrege. The Chamber office moved to 512 East Avenue, now a City parking lot. They developed a video describing what the Chamber was working on because people stated they didn't know what the Chamber was doing, and a "fair share" dues schedule was adopted. There was considerable discussion about how to improve the attitude and morale of the business sector. The Chamber's priorities included legislation, industrial development, community betterment and publicity and tourism promotion. They worked with HIDC to have Holdrege become a test city for the sale of “gasohol”; encouraged businesses downtown to "Clean-up and Fix-up"; and recommended removal of the parking meters when a survey of residents showed that 75% wanted them removed. There were some 120 volunteers working on about ten committees. The Chamber worked with the Central Technical Community College to establish a satellite center in Holdrege. They produced a slide show emphasizing the benefits to industry of locating in Holdrege and sponsored an Ag Appreciation Banquet. The Phelps County Visitors Committee was formed to be the Chamber's "tourism arm" while the Ambassadors replaced the Valko-men as the "membership and public relations arm" and the emphasis of the Industrial Committee turned to "economic development". The Dollars of Profit program for new business openings was started and the Chamber helped the City apply for a Community Development Block Grant to assist the Holdrege business sector. In the late 1980s, the Chamber organized a number of “brand-name” concerts, bringing in some of the nation’s top country artists to the Phelps County Fairground to entertain. Among the stars who sang in Holdrege were Tim McGraw, Alan Jackson, George Strait, Reba McIntyre, and Charlie Daniels. The Chamber continued to sponsor Country Music Concerts through 200I, selling well over 50,000 tickets, but interest eventually faded, attendance fell and the series was dropped. During the 90s, the Chamber organized a Desert Storm Rally for families of soldiers serving in the Persian Gulf. They assisted in promoting the Camp Atlanta Reunion at the Nebraska Prairie Museum, a hugely successful community event, bringing the Fort Riley Army Band to town for a community dance. The Chamber helped organize HERO, the Holdrege Economic Resource Organization, which was formed to actively recruit and retain business, and later helped reorganize it into what is today the Phelps County Development Corporation . Through HERO, the Chamber participated with Nebraska Public Power District at Industry Trade Shows; assisted Central Community College in setting up a local center; conducted a survey on a City sales tax proposal, which would become LB840; and conducted a letter-writing campaign supporting keeping the Central Nebraska Public Power and Irrigation office in Holdrege. They sponsored “strategies meetings” to encourage better communication between the towns in the county regarding economic development. The Chamber sponsored seminars and workshops on How to Start a Business, Community Development, the Americans with Disabilities Act, and Controlling Worker's Compensation Insurance costs. The office moved to a new location at 423 East Avenue. Among other projects, they helped organize the Phelps and Kearney Counties Leadership Development Program and were a catalyst for community projects such as the Heartland Cruisers Show and Shine Car Show, and the Farmers Market. They conducted numerous fund-raisers to construct the new "Welcome to Holdrege" sign at North Park. The 9/11 attack brought on a difficult economic period that accelerated an already-apparent loss of retail stores in Holdrege into the mid-2000s. The morale of the business community suffered and interest and participation in the Chamber declined. When the Chamber found itself without an executive director at the beginning of 2008, the leadership decided it was time to step back and rethink what the function and mission of the Chamber ought to be before they hired new leadership. Working with the Phelps County Development Corporation as facilitator, Chamber board members worked through long hours of discussion to develop a program of work – established goals with specific initiatives to see them accomplished. With the Program of Work in place, the board sought to hire an executive director who could see it through. Confident they had accomplished that goal, the Chamber launched a campaign called A New Beginning at the 2010 Community Banquet. Since 1904, the focus of the Chamber has been to help the business community help the community as a whole; to help businesses be stronger and more profitable; to protect our legislative interests; and to fly the flag, wave the banner, beat the drum and be the cheerleader for Holdrege in the wider world. Really, when all is said and done, things haven’t changed that much.